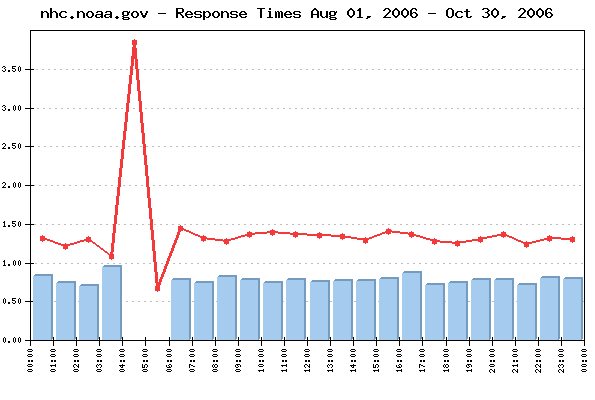 WebSitePulse provided free monitoring and notifications to some of the most popular websites during the 2005 Hurricane Season. The free service was part of our Company contribution to the relief efforts after Hurricanes Katrina and Wilma (see our Press Release for more details). After the end of the 2005 Hurricane Season, WebSitePulse management decided to dedicate some of its capacity and to continue the monitoring of the key websites providing real-time details, forecasts, emergency information, and donations' opportunities in times of hurricanes, floods, and other natural or man-caused disasters. This year, as the public Web Performance Reports became part of WebSitePulse contribution to the online community, data from the continuous, multiple-points measurements of some of the most used Hurricane- and disaster-related websites will be displayed on a daily basis during the most active time of the Season - August 1st and October 30th, 2006. The Reports reflect the most common performance criteria: response time and availability - but in-debt analytical information is also collected and stored in the WebSitePulse system for future references. An RSS feed from the daily Reports is added for more convenience for those interested in the performance of the monitored websites. The daily Average Response time from all monitored websites was 1.18 sec. 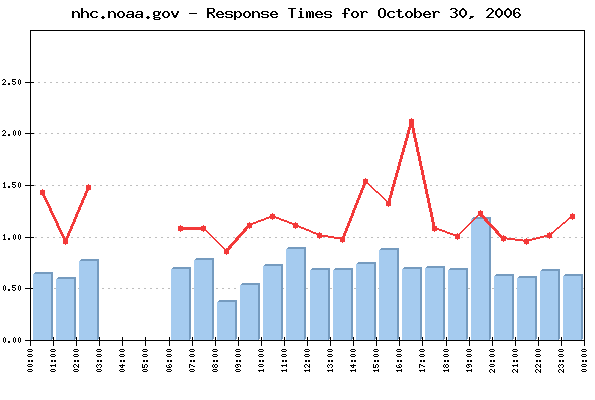 The Average Response time as measured from the US East Coast (Trumbull, CT) was: 0.785 sec. The Average Response time as measured from the US West Coast (San Francisco, CA) was: 1.724 sec. The Average Response time as measured from US Central (Chicago, IL) was: 1.032 sec. The Best Response time measured from the US East Coast was: 0.536 sec. The Best Response time measured from the US West Coast was: 0.581 sec. The Best Response time measured from US Central was: 0.397 sec. The typical page loading took the least time for floridadisaster.org visitors - 0.576 sec., while the visitors of salvationarmy.org had to be the most patient, as the page loading there took in average of 2.531 sec. 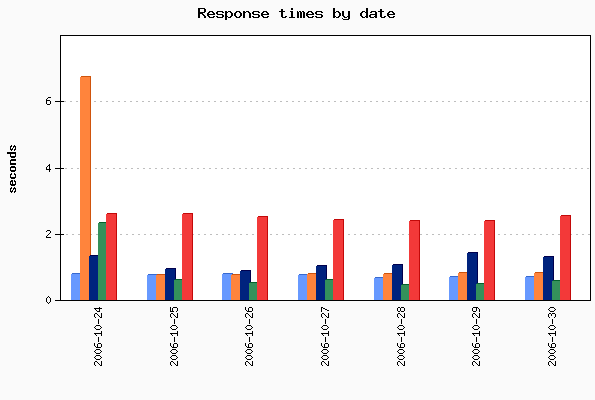 Two of the monitored websites delivered above-the-average response times for their web pages, while three of them demonstrated below-the-average daily performance. The daily average uptime for the entire Group was 99.87%. Three websites were available with no interruptions - 100%. Three websites' availability was above the average, while two sites dragged the average down with below-the-average availability. No events of particular importance or possible negative impact on the online visitors' interaction with the Websites included into the 2006 Hurricane Season Report were detected during the reported period, and according to WebSitePulse, the Group delivered the expected levels of End-User experience and Customer satisfaction.